Stormbukta is far south on the west coast of Spitsbergen, between Hornsund and Spitsbergen’s south cape. It was named after a person and not after the strong winds that are often blowing here; the latter would actually have been equally appropriate. They say the most interesting places are often the most difficult ones to get to; Stormbukta is a good example for that. It is completely open to the often stormy north Atlantic in the west, and the shallows can make landing tricky. 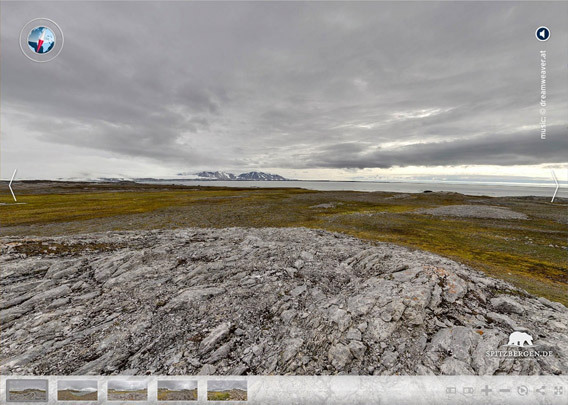 It is for good reason Sørkapp Land is not exactly amongst the most frequently visited parts of Spitsbergen. But there is something special to Stormbukta, it is a unique place. Amongst others, there is Spitsbergen’s largest spring, called Trollosen (“troll spring”). It is actually a river coming out of a karst cave, pouring about 20 cubic metres of water per second over a short distance into the sea. The water flow owes its existance to the combination of water-soluble carbonate rocks and a geological fault, which probably initiated groundwater flow even in permafrost conditions. The wide glaciers of Sørkapp Land provide sufficient meltwater. During World War II, the Nazis established secret weather stations in remote parts of the Arctic. In mid October 1944, a submarine transported 2 Norwegians complete with equipment to Stormbukta to provide the German air force with meteorological data used, for example, to plan attacks on allied convois. The station hut was built behind a little rock hill, not visible from the coast. From early May 1945, the 2 Norwegians in German service sent their weather data not in coded form, but used clear text. They were not picked up before early August and had to serve 2 years in prison in Norway for having served for the German military secret service “Abwehr” in Stormbukta. From an elevated position, the landscape features of Stormbukta become clear. Olsokbreen is visible in the south. Between the coastline and the coastal mountains, there is a stripe of flat land, as is typical for large parts of Spitsbergen’s west coast. The tundra there is mostly barren, but patches of lush green tundra indicate the presence of bird cliffs in the vicinity. Thousands of kittywakes are breeding on some steep cliffs in Stormbukta, an ideal home also for an arctic fox family. All an all, Stormbukta has a lot of both typical Spitsbergen west coast characteristics and some unique features (the spring Trollosen, remains of the war weather station Landvik). Landing conditions are often dificult, if not impossible, and you can call yourself happy if you have been there.